My cute one and a half year old little sweetie has become more sweet! 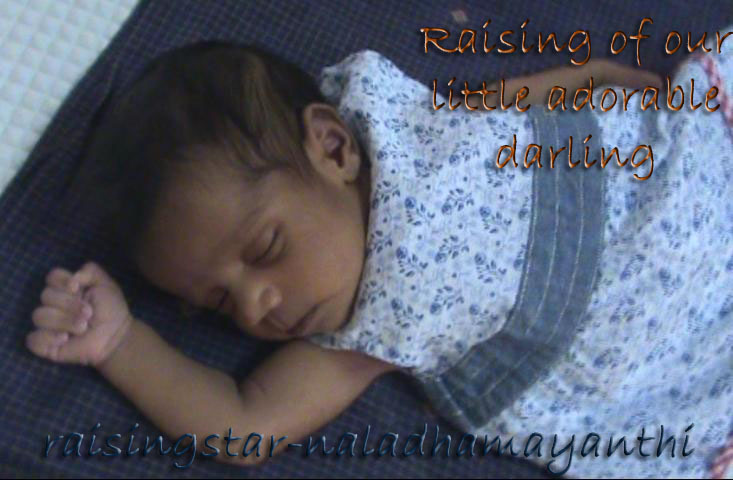 Yes, these days Thamizhini understands what I tell her and follows it, even what her grandma tells. I really feel that she has become a disciplined tot. She has much more developments in attitude compared to previous months. As she is able to talk to some extend, she could express what she wants too! Even though she demands that I have to feed her food, she is quite good in her eating manners. She sits in one place and eats. She doe not get disturbed with anything, even if TV or toys. Do u know what is her dining place? She likes to sit and eat on her Toy Car. Thanks Sharmi for this wonderful car! Whenever I say that food is ready, she will just run to the Car and waits for me to give food. Also she likes to feed herself. Earlier though, she ate herself with our help, but that time she spills out food in the floor and that would be of waste. But now she is more concerned about not to spill food. She likes to take in hand / spoon and eats perfectly. If Idly, Dosa kinda food, I make it small pieces and keep in plates, she herself takes and eats. If upma, curd rice or any porridge, she herself takes in spoon and eats nicely. She follows how we do for her, like, takes a spoon full of food and cleans the corner of the spoon and takes to mouth. Also she cleans her mouth with spoon when the food goes out of her mouth. I would simply sit with her by watching her when she eats in spoon. I feel really proud that I made this change to her. Now she knows the importance of the food and she follows timing too. These days I don't felt any trouble from her for food. She really like and enjoy eating. I feel happy that she came to a routine in her eating habits. I know the pain when they don't eat and I everyday see in my apartments, how mommies are running behind the kids with the plates on their hand in parks and play areas. Me decided in the early days itself, by seeing them and I strictly told my parents not to feed her outside of Flat. If I see other developments, she likes to sit and play some games. Before she always likes to drop the things. Whatever she wants, we have to give her and she will drop that from top to bottom and roam around the house. These days she plays all the board alphabets and likes to see her books for new animals.